To start Linkurious, run the start.sh script in the linkurious-linux directory. Alternatively, run the menu.sh script and click Start Linkurious. By default, Linkurious server will listen for connection on port 3000. However, some firewalls block network traffic ports other than 80 (HTTP). 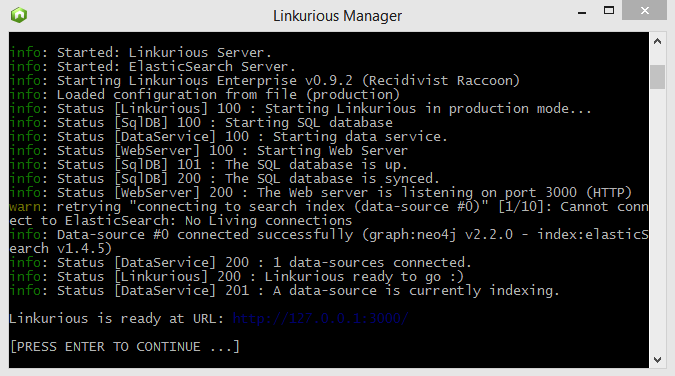 See the Web server configuration documentation to learn how to make Linkurious listen on port 80. To start Linkurious, run the start.bat script in the linkurious-windows directory. Alternatively, run the menu.bat script and click Start Linkurious. The firewall of Windows might ask you to authorize connections to Linkurious. If so, click on Authorize access. To start Linkurious, run the start.sh.command script in the linkurious-osx directory. Alternatively, run the menu.sh.command script and click Start Linkurious.